We visited today the neighboring towns of Yasouf, Burin and Madama. Burin was the town that suffered an attack by settlers the last week (see post below) after the Israeli army destroyed a settler outpost. Settlers and villagers were throwing rocks agains each other. Finally some settlers set fire on a closed by hillside. Everywhere in the area around (as like as in the rest of the Westbank) you will find the Israeli settlements on the top of the hills, trying to occupie more and more of the land by creating outpost after outpost on neighboring hilltops. After two years these illegal outpost become legal by Israeli law (even so they are still illegal under international law) and from then on the army has to protect the settlement. Indeed, sometimes the army destroyes illegal outposts but much too seldom. The local Palestinians have the (true) feeling, that the army is only around to protect Israelis without regard to official or international law. 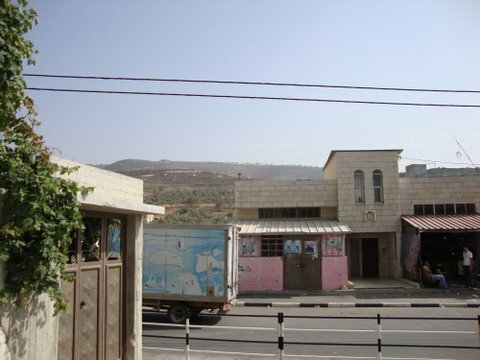 We met a Palestinian family in Burin that lives close by one of the settlements and suffered severe attacks by settlers, coming close to the house, trying to kick in the door or throwing rocks. Recently their solar panels on the roof got destroyed by rocks. 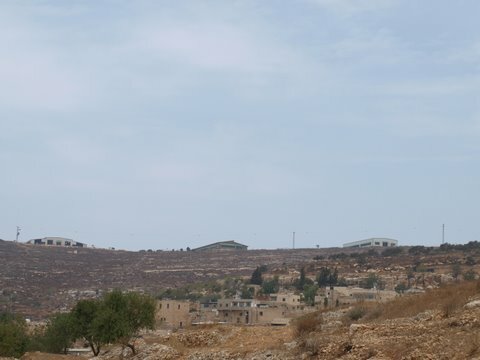 Like in many other cases throughout the region and the Westbank the family lost part of its land to the illegal settlement and settlers were destroying their olive trees or attack them with stones when they try to harvest the olives in the fall. Regurlarly the army has to protect Palestinians when it comes to harvest time from the attacks of settlers (even so Palestinians are sometimes only allowed to harvest for a few days and just leave their land uncultivated because they fear the settlers). There were some incidents throughout the Westbank when Palestinians attacked Israeli settlers and settlements, in some cases settlers were shot by armed Palestinians. And there are also some villages and cities where the local Palestinian population will regurlarly demonstrate against the Occupation with throwing stones against settlers and the army. But most of the people we met were frightened by the presence of armed settlers around there town and could tell of incidents when they were confrontated with open violence by settlers. Most of their lives are unbelievable difficult, since they lost parts of their land, are not able to use their land properly and face regular provocations by settlers (not talking about the limitations in their daily lifes because of checkpoints and other measures by the Israeli military).